It’s finally here. After an announcement earlier this year, Google finally revealed their new open-source project named Chromium OS. As the name implies, it’s closely associated with the fairly new and increasingly popular Google Chrome browser. Although it won’t be available to users for another year, they plan to work with the open source community and developers to make improvements before an official launch. Just about every line of code is available to anyone who wishes to contribute to the project. Google hopes to begin to make final implementations to the code through out the next year. For the most part, it’s unlike any other operating system. It focuses at making the web a better experience rather than on local desktop applications. 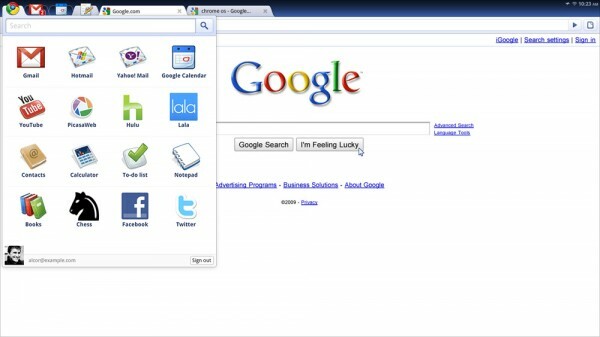 Chromium tries to utilize Google’s vastly growing “cloud computer” network. Instead of installing applications, most will run right out of a browser, while still offering a similar experience. The entire OS caters to the idea of a light weight operating system. Most data will be stored on Google’s network instead of your computer’s hard drive. Google also boasts safer working environment since each application would be contained within a “sandbox,” preventing access to other bits of data on your machine. It supposedly can fix itself with a simple reboot if the base code becomes damaged. Reboots don’t take long either, Chromium takes just a few seconds to start up. With that kept in mind, the OS will initially be designed for low-powered Netbooks. It won’t be able to replace a full Windows, Macintosh, or Linux system anytime soon, but it would be a great complement. So does it mean that without internet, this machine is pretty much a door stopper? You can’t even login to it the first time without Internet!